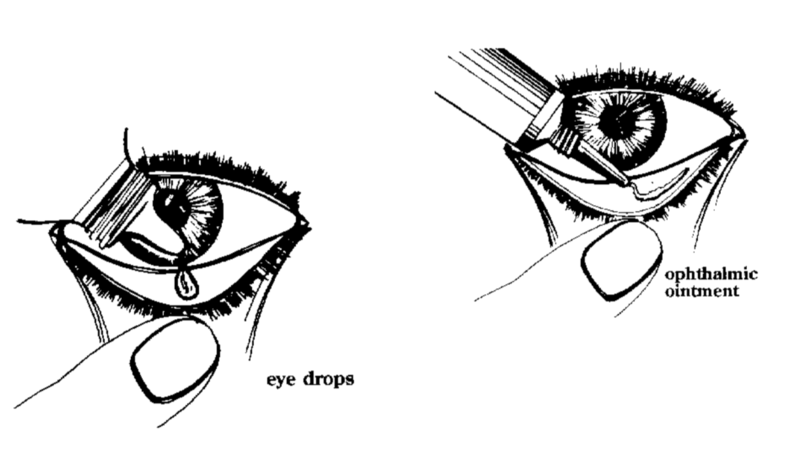 Tears lubricate the surface of the eye. Contrary to the simplistic view depicted on the television, tears are a very complex substance. Mucin Layer: The mucin layer is a mucoprotein. It is the layer that touches the cornea and the conjunctiva. 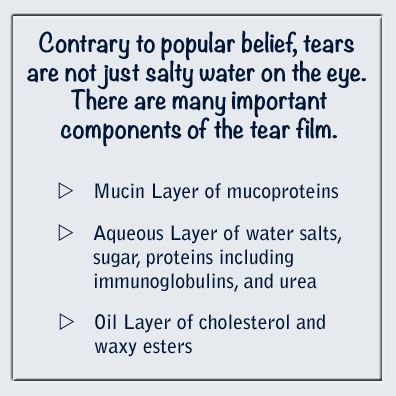 The mucin layer is the layer that is responsible for making sure that the tears are uniformly distributed across the surface of the eye. If the mucin layer is deficient, the tears will bead up after a blink just as water will bead up on the surface of a waxed automobile. Aqueous Layer: This is the water layer of the tear film. The aqueous layer is the bulk of the tear film. Oil Layer: The oil layer is the outside part of the tear film. It is the layer that is the furthest away from the cornea and conjunctiva. The oil layer protects the aqueous layer by reducing the speed at which the aqueous layer evaporates. We are bombarded daily with advertisements for artificial tears and drops that “get the red out.” You have learned that the tear film is a complex multi-layered substance that is not easily reproduced by commercially available products. Not only do the commercial tear preparations fail to replace our lost tears adequately, but they also make matters worse by washing away what little tears you have. Almost all of the products on the market have preservatives in them in them. Preservatives are chemicals that keep the drops from becoming contaminated, but they are uniformly harmful to the surface of the eye. Some of them are only a mild problem, but others can produce severe damage to the cornea. The use of a preservative-free product eliminates the harmful effects of the chemicals but does not remove the washout effect. Occasional use of a commercial artificial tear or redness reducing drop is acceptable, but regular use of these products may cause temporary or possibly permanent damage to the surface of the eye. Please limit the use of artificial tears to no more than four times per day. If you feel that you need to use them more often, you should consider other forms of dry eye treatment. You may use preservative-free lubricants. There are many acceptable lubricants on the market. Here is a short list. There are others that are also acceptable. Just make sure the container specifically states the product is preservative-free. Keep in mind that you should only use lubricants sparingly. Overuse of any eye drop will deplete the eye’s naturally occurring nutrients. Puncta (plural of punctum) are little drains in your eyelids that carry away excess tears. The puncta drain tears away from the eye and into the nasal passages. Look at the inside of your lower eyelid about midway between the center of the eyelid and your nose to see one of your puncta, a little bump with a hole in it. There is one punctum on each of your four eyelids. A patient with normal tear production would continuously need to wipe tears from their face if the puncta were not functioning. For the tear deficient patient, the puncta, unfortunately, drain away what little tear film there is present, and leave the surface of the eye insufficiently lubricated. With these forms of treatment, there is no change in the rate of production of tears. Instead, there is a decrease in the drainage of the tears. Punctal plugs are soft and pliable. Your physician can easily insert them in the puncta in a process that takes about 45 seconds and only requires a drop of local anesthesia to numb the area. Temporary plugs dissolve, but permanent plugs can last forever if they are not rubbed out by the patient. For the rare patient that does not like these plugs, they can be removed easily without anesthetic drops. For the occasional patient with dry eyes in which the permanent plugs get rubbed out, the puncta can be occluded permanently. This is a straightforward five-minute procedure done in the office with local anesthesia to numb the area. This procedure is not easily reversed. Dry eye syndrome occurs in nearly every LASIK patient. Recent ophthalmic literature states that dry eye syndrome occurs in 100% of LASIK patients. For that reason, we recommend temporary plugs for all LASIK patients to provide a smooth and nurturing tear surface for the critical week or two following the procedure. An occasional LASIK patient will find the week or two not adequate and will need permanent plugs inserted after the temporary plugs have dissolved.